Note: Not everyone who has celiac disease can tolerate oats, even when the oats are gluten free. If you have questions, talk to your physician or dietitian. TIP: Click here for our earlier posting of this recipe to see some of the inventive ways our readers made these granola bars even healthier by using substitutions for the condensed milk and corn syrup. Optional: added flavour boosters such as 1 tablespoon orange or lemon zest, a bit of maple syrup, pinch of cinnamon, or 1 teaspoon vanilla. The version in the photograph used crispy rice, raisins, mixed nuts, chocolate chips and maple syrup. Heat oven to 325 degrees and line 9 x 13 pan with parchment (or grease the pan). In small sauce pan, melt the margarine, add condensed milk, corn syrup and flavour booster if using. In large bowl, mix remaining ingredients. Slowly pour the syrup over the dry ingredients while stirring. Combine well. Press into pan and bake for 25 minutes, or until edges are golden brown. Cool for five minutes and then score into 15 pieces with a knife. Cut on score marks when completely cool. 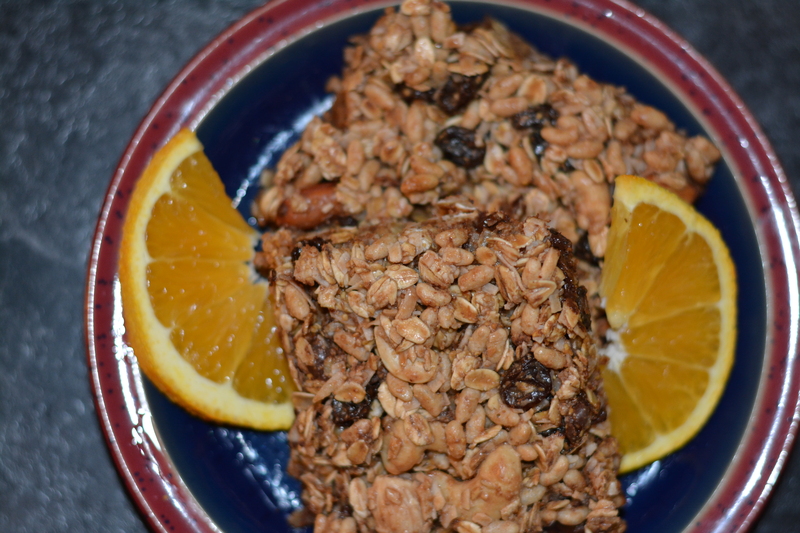 This entry was posted in Baking, Breakfast & Brunch, Recipes and tagged breakfast bars, celiac, celiac diet, coeliac, cookies, GF, gluten free, gluten free in Red Deer, gluten free snack, granola bars, oatmeal bars, recipe, squares, vegetarian. Bookmark the permalink. You’re welcome. Gluten, egg, dairy and soya? Wow. That must make shopping difficult. We just have gluten to worry about! We eat a lot of real food here. Veggies, fruit, grains, etc. It gets complicated in that I don’t eat meat, my 7 year old animal rights activist wants to be a vegetarian but will eat meat if it is “delicious” and my little one with all the sensitivities would eat a 100% meat diet, lol Trying to find a family meal is a challenge!! Have a magical day!